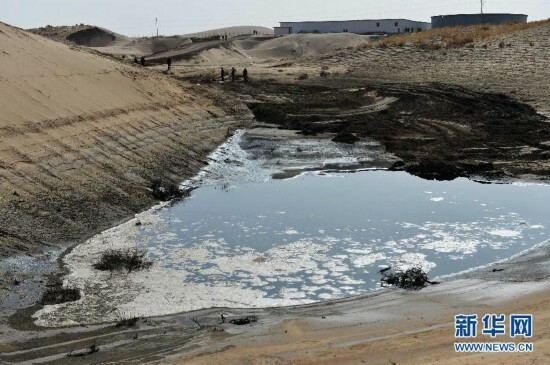 A company in Gansu Province that discharged waste water in the Tengger Desert has been shut down and fined 3 million yuan ($484,000), officials have revealed. Two managers at the Ronghua Industry & Trade Company in Wuwei city were detained amid nationwide efforts to impose tougher punishments on polluters. The company discharged more than 83,000 metric tons of untreated water in the desert through a concealed conduit between May 28, 2014, and March 6, according to a statement released by the city's government on Saturday. The polluted area is 23 kilometers east of the city and covers 18 hectares. Most of the waste water has been collected and transferred to sewage treatment plants, and the remaining pollution will be dealt with later. Ronghua Industry & Trade moved to a site in the city's Liangzhou district and started producing cornstarch and glutamic acid there in May last year. However, the equipment needed to prevent and control pollution was not installed when the plant started operating. The company was ordered to suspend production, and the concealed conduit was removed. In addition to the fine, it had to pay a pollution discharge fee of more than 180,000 yuan, the statement said. The company's chairman has been investigated for allegedly polluting the environment, and officials at the district and city governments have been suspended.